What’s with it already getting to almost triple digits here in Phoenix?! It can’t already be that time of year can it? Sadly, we are starting to heat up. Fortunately, that means it is time to hit up Phoenix Public Market for delicious salad ingredients! This month we decided to create a recipe inspired by one of our favorite shows, Game of Thrones. 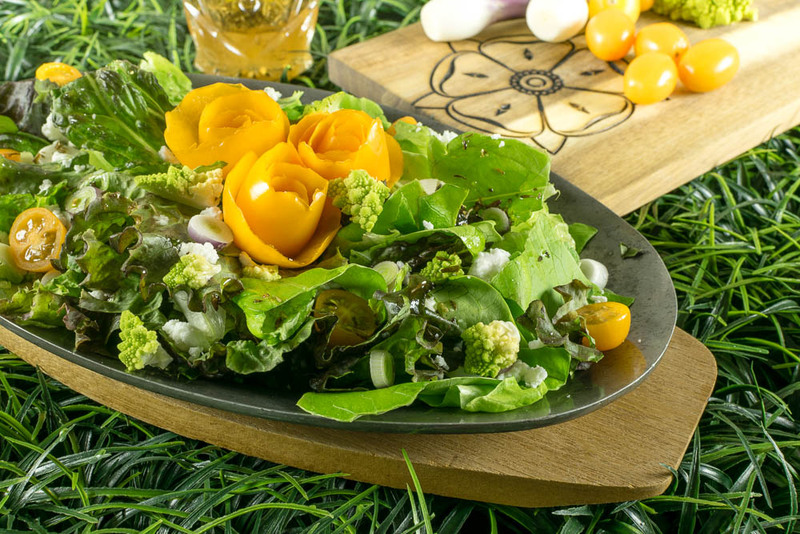 Our Highgarden Salad with Champagne Vinagrette is light but bursting with flavor! What House would be more perfect for a Farmers Market recipe than House Tyrell? With the motto Growing Strong and their sigil a golden rose, it couldn’t be more perfect. House Tyrell is based in the lush and fertile southern region of Highgarden. We won’t spoil the ongoings of Game of Thrones for those who aren’t caught up, but House Tyrell and Highgarden play an important part in the most recent seasons and are one of our favorite houses in the show. Our idea for a Highgarden Salad was actually partially inspired by one of our favorite sites, The Gluttonous Geek. When we saw the beautiful golden tomatoes at Abby Lee Farm’s booth we knew we wanted to do a salad inspired by House Tyrell. However, we decided to create a different type of salad all together. 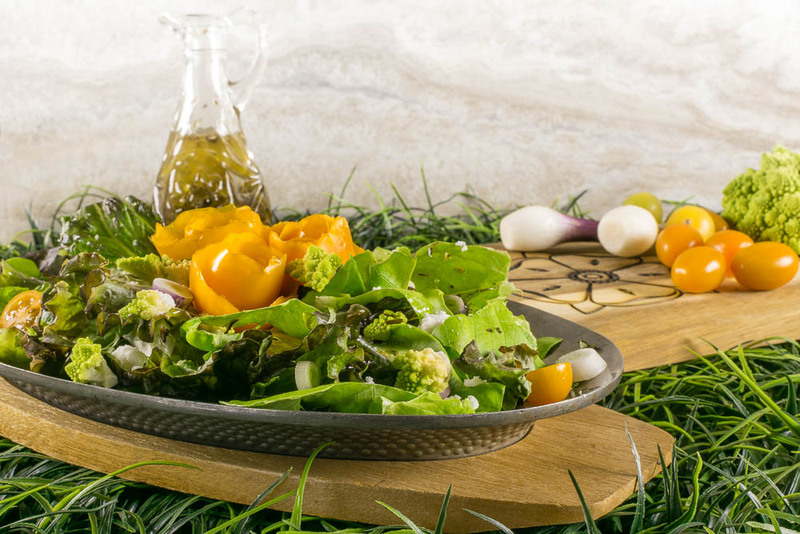 Using the wonderful Herbs de Provence spice blend from Carefree Spice Co., we created a bright dressing that also uses orange marmalade! The final ingredient that makes this salad magical is the Chile Acres Farm Plain Chevre! Since their chevre is made fresh, it tastes completely different than the kind you find at the grocery store. We hope you enjoy our Game of Thrones inspired Highgarden Salad! With the weather warming up, it pays to get to the market early! Fortunately, Phoenix Public Market stays open all year and when it gets really warm they turn on the misters! What kind of geeky recipes would you like to see next month? We’d love to hear your thoughts! Leave a comment below or use the hash tag #GeekEats! Also, be sure to give us a follow on Instagram! Combine all salad dressing ingredients in a bowl. Toss salad ingredients (except for tomato roses).